Looking for private in-home or in-studio Harp lessons? Our Granada Hills teachers are ready to get you started. Find your teacher today! Check out some of our most popular teachers near Granada Hills, CA including Los Angeles, Long Beach, Glendale, Burbank and Pasadena. technique, it makes things much more fun and easy six months later, I promise! Beginning students will learn how to read notes, understand basic theory, and technique in a short amount of time, so don't be scared if you have never had a music lesson before. Alexandra has been teaching harp and piano around the country for eighteen years through her personal harp studio and the Salvi Showroom in Southern California. She has also worked as a sectional coach for the Orange County Youth Symphony, Asia America Youth Symphony, and Palos Verdes Regional Symphony Orchestra. Her students are currently attending Eastman School of Music, Columbia University, Barnard College, Harvard University, Boston College, University of Pennslyvania, Princeton University, Northwestern University, University of Notre Dame, Yale University and Purdue University among others. Her students have also appeared on National television as well as playing for the Grammy Awards. the distinguished Anne Adams Awards Harp Competition where she has been a main Director for fifteen years. She has served as the President of the Orange County Harp Society Chapter as well as a board member of the Bay Area Harp Society Chapter. Alexandra received her Bachelor's Degree from DePauw University, majoring in Music and Anthropology. She also completed premedical studies at DePauw after spending her Junior year studying harp at the University of Oregon. She received her Master's Degree from Roosevelt University in Orchestral Studies, and did post graduate work at the University of Southern California in Harp Performance and Anthropology. 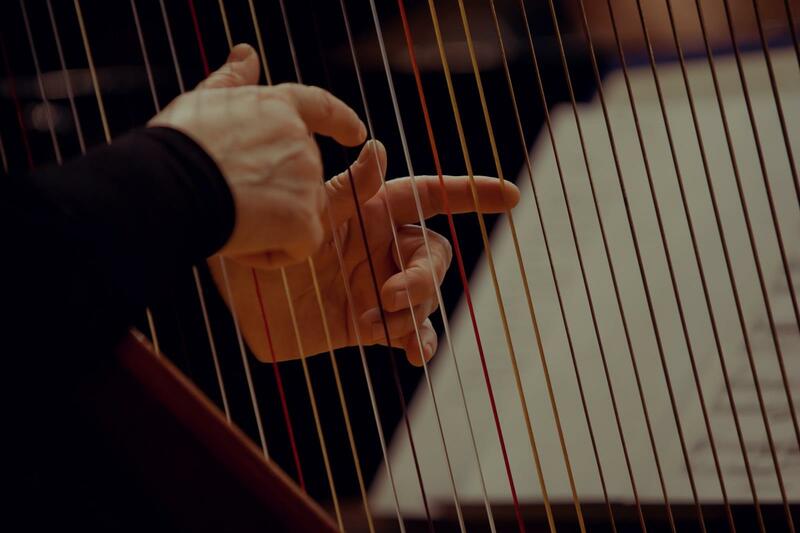 Alexandra's harp teachers have included: Sarah Bullen, Sally Maxwell, Edward Druzinsky, JoAnn Turovsky, Harriet Thompson Moore, Kara Bershad, Faye Seeman, Joy Andreasen, and Neva Lydiard. She has also had many mentors who have guided her life and career including: Kathleen Bride, Victor Salvi, Sally Maxwell, Patricia Masri- Fletcher, Robin Gordon- Cartier, Carrie Kourkoumelis, Dr. Craig Pare, and Karen Thielen. Alexandra has performed in many master classes given by such internationally known harpists as Skaila Kanga, Jana Bouskova, Marie Pierre Langlamet, and Bryn Lewis. She has also organized many masterclasses and events featuring: Kathleen Bride, Sarah Bullen, Gwyneth Wentink, Patricia Masri - Fletcher, Louise Vickerman, Sivan Magen, Sasha Boldachev, Ina Zdorovetchi, Angel Padilla Crespo, Elzbieta Szmytt, Susan Allen, Gayle Levant, Stella Castelucci, Robin Gordon Cartier, Emmanuel Ceysson, Yolanda Kondonasis, and Kim Robertson. Alexandra has performed extensively throughout North America and Europe as a soloist, with small ensembles, and as an orchestral harpist. She has appeared in several television shows such as General Hospital. Her playing,"Is filled with care, artistry, and mature interpretation. She is a talented musician, well rounded in her knowledge of music, and has a healthy curiosity in areas beyond music." (Donald Chen, conductor) "Everything I heard was sensitive, artistic, and had beautiful intonation." (Richard Ferrin, violist emeritus, Chicago Symphony Orchestra). In addition to playing, Alexandra has also served as the Ambassador for Salvi Harps in North America for the past eleven years. She has given numerous masterclasses and workshops in addition to performing at National Harp Conferences and National and Regional music showcases. In her role as National Sales Manager, she helped harpists from all over the world find their dream harps, learn to care for them, and has mentored them along the way. Apart from harp activities, Alexandra also enjoys teaching middle school, teaching piano, coaching rowing, participation in sports activities, and writing articles for various journals including: The American Harp Journal, Chicago Health Magazine, and Atlanta Health Magazine. She also enjoys being a board member on the DePauw University Alumni Board and she enjoys working on music startup companies. arpeggios musically and be able to play at least one piece memorized. your pace. In the end, lessons are about you personally and not someone else. As a PIANO teacher, I want students to learn about music and not just the piano. Students will learn basic music theory and basic scales as a part of their lessons. They will also occasionally choose a song of their choosing to work on chords. I do promote note reading and theory, so I am not the right teacher for students who don't want to invest time in learning the basics. These basics are the building blocks of all music and can be used for any instrument the student chooses to learn in the future. I have harps and a piano at my studio, so you do not need to bring your harp to lessons. If you don't own a harp, you can rent one for around $45/month from several sources. HARP - Grandjany Technique with an incorporation of Salzedo and French school depending on the player's body type and technical difficulties. I make use of the ABRSM as well as local, national, and international competitions depending on the student's level of commitment. PIANO - I teach basic piano for fun through an Intermediate level. Although some students choose to take CM and ABRSM exams, I do not push them. I want students to enjoy piano and music lessons. Alexandra has met all my expectations. She is very patient. I feel like we are moving along at a good pace. I had zero musical experience and after only 3 lessons can read basic sheet music and actually have music come out of the piano!! I am enjoying the whole process. Great first lesson! Looking forward to next week. Teaching all levels, from beginning through advanced. I recommend adults to take one-hour lessons every other week. Children do better with half hour lessons every week. Ask about renting a harp! I have been teaching harp for 10 years and absolutely love sharing my knowledge of this wonderful instrument! I have a Master's in Music, Harp Performance from USC Thornton School of Music where I was the Assistant Harp Instructor for the duration of my studies. I teach both Pedal and Lever Harp and incorporate classical technique and repertoire as well as jazz and world music into my lessons. I've been involved with harp for over half of my life, and can't wait to share the magic of harp lessons with you. I love working with students of all experience levels and ages. Reach out today to get started with your lessons! Hi, there! My name is Liann and I've been teaching private lessons since 2014. I love sharing the joy of playing the harp with others. I received my Master of Music degree from Shenandoah Conservatory in 2015, and my Bachelor of Music degree from Ball State University in 2012. I'm a very warm and enthusiastic person and my teaching style is structured and supportive, which I think will be a great fit for you! I learned so much. I am so glad that I found such a great teacher for the harp. Liann is patient, encouraging and knows when to either break concepts down or challenge me with something new. Liann was so pleasant and knowledgeable. She helped my son with his audition music. We look forward to working with her again. I'm a professional harpist who graduated from Yale University with a B.A. in Music with extensive teaching experience in the United States and Belgium. I am offering harp lessons to students of all backgrounds, levels, and ages. I am currently in the process of completing my Doctor of Musical Arts at the CUNY Graduate Center. I hope to transfer the skills and knowledge I have obtained from working with some of the most renowned harpists to my own students. Teaching is a passion for me. Whether you are just taking lessons for fun, or whether you are serious about creating a future professional career, I will be equally attentive to your needs. I like to ensure that my students progress during the lesson, but not at the expense of having fun! I believe that a relaxed atmosphere is essential to the learning experience. I'm a professional harpist who graduated from Yale University with a B.A. in Music with extensive teaching experience in the United States and Belgium. I am currently in the process of completing my Doctor of Musical Arts at the CUNY Graduate Center. Chelsea is a fantastic teacher who combines a disciplined mastery of the harp with a genuine understanding of each student. She is engaging and kind with children and a lovely person and teacher in every way. We love working with her and it has been extremely gratifying to witness our children’s progress under her tutelage ! I feel so lucky to have her as our teacher. Chelsea is WONDERFUL! She has supported every aspect of our son’s development with regard to his harp playing and we are so grateful for her support!! Chelsea is a top professional and anyone would be lucky to have her teach music!! I had the benefit of taking lessons from Chelsea after I had been learning to play for a bit over a year. She was both encouraging and warm personally, and gave me several ways to think about technique, which helped a great deal. She was able to give me insights to help me get into music theory, as well as technique and practical questions, all so valuable for a beginner! I am an experienced teacher who is committed to helping every student achieve their personal goals at the harp. I have worked with all ages and abilities and I'm excited to work with you! I am open to working on any type of music you'd like to and can also help you develop a better understanding of music theory. I earned my harp performance degree from the Lamont School of Music at the University of Denver. I am a friendly, outgoing, and passionate music teacher! I play the harp and piano and absolutely love to spread the joy of music. I started playing the harp because my grandmother was a harpist and I thought it was the most beautiful instrument. After all these years, I still love the amazing sound of the harp. I completed my degree in Harp Performance from University of Denver's Lamont School of Music where I received a well-rounded education in both performance and academics (including theory, history, and technology). Please let me know if you have any questions- can't wait to get started! Becca was flexible to come to our home and very sweet and professional. A great first experience into piano. Becca is a wonderful music teacher. She taught piano to both of my girls (ages 8 and 10). She was patient and inspiring. They couldn't wait to see her every week! Becca was a wonderful first piano teacher for my daughter. Highly recommend her—professional, patient, kind. I believe lessons should be fun and expansive journeys. I enjoy truly connecting with each student in a light, enjoyable atmosphere. Lessons are tailored to meet each student where they are at, while still pushing them at a rate that inspires them. Positive reinforcement and constructive feedback are always used, while negative criticism is not. I specialize in teaching proper harp technique designed to allow the player to play for a lifetime! If pain arises from playing students will never be asked to push through pain or discomfort. Rather, we will find a different approach that works. Lastly, I love working with students on pieces they really love. No piece of music is off limits! We can make any song work on the harp! Hello there, and thank you so much for considering me as a potential teacher! I truly love teaching and so enjoy connecting with each and every student. I have been playing the harp since age six. While I am primarily a classical pedal harpist, I also love to play jazz, pop, folk, and contemporary music. I love teaching all of these styles as well, and students may choose to play either the lever harp or the pedal harp. ting styles and pieces tailored to each individual student’s musical taste and goals. Currently, I am completing a certification in Clinical Musicianship. I am thrilled to be learning about the endless healing components of harp music. I believe that music should be a source of joy, a belief that is ever present throughout her lessons. Pheobe is very patient and kind. She understands my goals and moves at the pace that allows me to learn the basics. She has been an ideal teacher for me and playing the harp has been a wonderful addition to my life. She was excellent! She explains everything very clearly. I'm looking forward to practicing and our next lesson. For beginners, I offer Suzuki method lessons, or a combination of the Suzuki method and other beginning songs/books depending on interest. For intermediate lessons, I can continue Suzuki lessons, or teach other classical, jazz, popular, etc. music, as well as learning to sing while playing the harp, worship team, bands, and electric harp techniques. Rebecca Moritzky has played harp for nineteen years. She performs regularly across the Denver Metro and Colorado Front Range area. She obtained her Harp Performance degree from the Lamont School of Music, University of Denver, and recently a second degree in Worship Arts from Colorado Christian University. Rebecca is the principal harpist for the Denver Philharmonic Orchestra, and the Lakewood Symphony Orchestra. She recently performed with the Colorado Symphony Orchestra. She plays with two different worship teams on Sundays with the electric harp. Rebecca has played for over 500 weddings, tea rooms, churches, receptions, and other events through her Heart Strings Harps business. 11, Rebecca performed at the World Harp Congress in Vancouver, British Columbia. She won the Lakewood, Colorado-Chester, England Sister City Concerto Competitions in 2013 and in 2015. Both times, she performed a concerto with the Lakewood Symphony Orchestra and traveled to Chester, England to perform in four different venues as a People to People Ambassador. Her 2015 concerto piece was recorded for Colorado Public Radio. In 2016, she performed as part Josh Groban’s orchestra in Denver. With the Denver Philharmonic Orchestra, Rebecca toured and performed in 14 cities through China playing harp and percussion in 2016. She performed at the Harps in Worship conferences in California and Colorado. Can't find a teacher in Granada Hills, CA? Students are raving about their Harp instructors on TakeLessons. Check out some of these recent reviews. e and playing the harp has been a wonderful addition to my life." Los Angeles, CA teacher: Pheobe S.
"She was excellent! She explains everything very clearly. I'm looking forward to practicing and our next lesson." "Liza is extremely flexible and patient. She has tailored each lesson to my specific needs and has given me tools I needed to make me a better harp player. She chooses pieces that challenge me and has allowed me to chose from several different pieces/styles that I would enjoy learning, too. If I had to miss a lesson for some reason she went above-and-beyond to accommodate a make-up lesson. She has always been very encouraging and I have loved having her has my harp teacher! --Olivia (14 years old)"
Los Angeles, CA teacher: Liza W.